Spend a day cycling and exploring traditional Balinese villages on this 6-hour bike tour. You will visit the villages of Bayung Gede Kintamani, Taro, and Keliki, and enjoy a 2-hour downhill route through the countryside that provides views of the scenic Bali landscape, temples, and rice fields. You have the chance to see a bit of daily life for the Balinese people while learning more about island culture. Tour is limited to 15 people. Upon arrival at the cycling start point located in the high hills of Bayung Gede, you'll be fitted with your bike and helmet. Listen to a short briefing about your tour and safety procedures from your guide, and then take off through the countryside. Follow your guide on a journey to shows you a variety of coffee and cocoa plantations, green rice fields, river valleys, off-road tracks, rainforests, and more. Along the way, see some of the native villages where local people go about their daily routines; some villagers work on their land, Balinese women prepare the daily prayer offering, and kids play outdoors. This bike tour is designed to give you a break from Bali’s busy main roads so you can discover the island's natural environment, only accessible by getting off the beaten path. 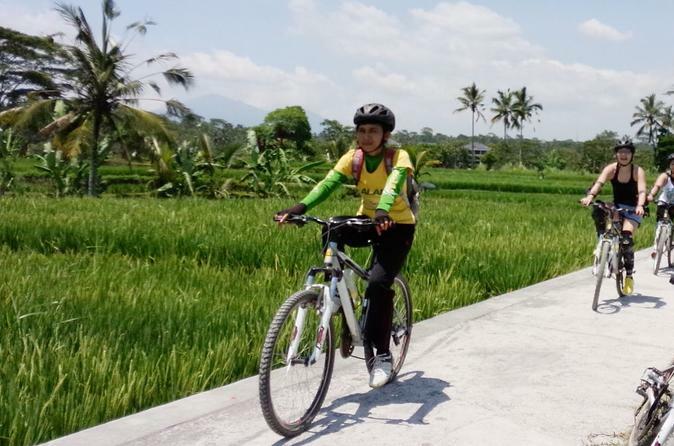 Ride through Taro, Keliki, and on to Sebali, and enjoy a lunch of various Indonesian dishes, salad, and fresh local fruit. Your tour ends in the mid-afternoon with return to your accommodation.